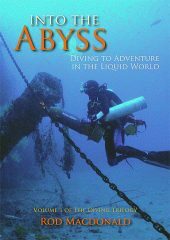 Into the Abyss, the first volume in The Diving Trilogy, is a fascinating collection of true life diving adventures from Rod’s long and varied diving career. It follows his progression from novice diver in the 1980s through the dangers of the deep air diving era and on to trimix diving in the 1990s where divers began to use commercial mixed breathing gases as the sport of technical diving was born. This opened up vast, previously inaccessible, swathes of the seabed, ushering in a great era of discovery of virgin shipwrecks, lost in time. Rod takes the reader to famous shipwreck sites around the world, from the sunken Japanese Fleet at the bottom of Truk Lagoon and Palau in the Pacific, to diving the third largest whirlpool in the world – the Corryvreckan Whirlpool off the west coast of Scotland. He describes this and many other terrifying incidents in which he and his colleagues have come close to death. This is a very good read and I would highly recommend it to anyone with an interest in this area.